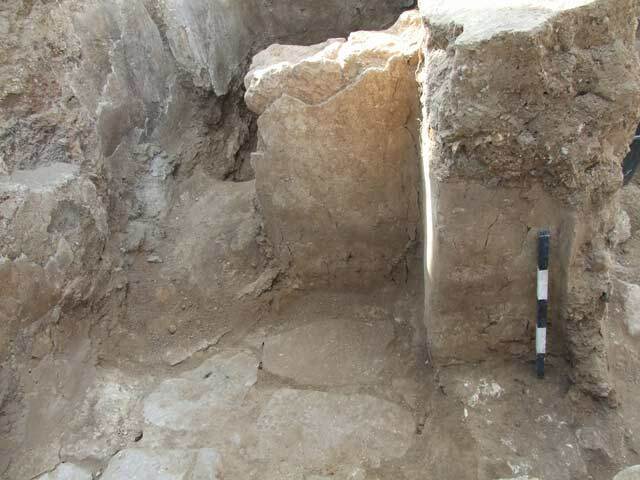 In December 2015 – February 2016, an excavation was conducted in the southern part of the six-chambered gate at Tel Lakhish (Tel Lachish; Permit No. A-7590; map ref. 185579/608090; Fig. 1), prior to development. The excavation, conducted on behalf of the Israel Antiquities Authority and underwritten by the Israel Nature and Parks Authority and the Landmarks Project of the Ministry of Jerusalem and Heritage, was directed by S. Ganor and A. Kreimerman (field photography), with the assistance of Y. Al-ʽAmor (logistics), M. Kahan and D. Porotsky (surveying and drafting), G. Fitoussi and E. Aladjem (aerial photography), J. Bukengolts and T. Gonen (pottery restoration), S. Gal (isometric drawing), C. Amit (studio photography), L. Kupershmidt (metallurgical laboratory), R. Kislev and R. Shoef (conservation), Y. Garfinkel, D. Ussishkin, L. Singer-Avitz, A. De Groot, Y. Abadi-Reiss, H. Khalaily, G. Avni, J. Seligman and Z. Greenhut (consultation), Z. Margalit, T. Tzuk, T. Holtz (Israel Nature and Parks Authority) and Project 500 laborers. 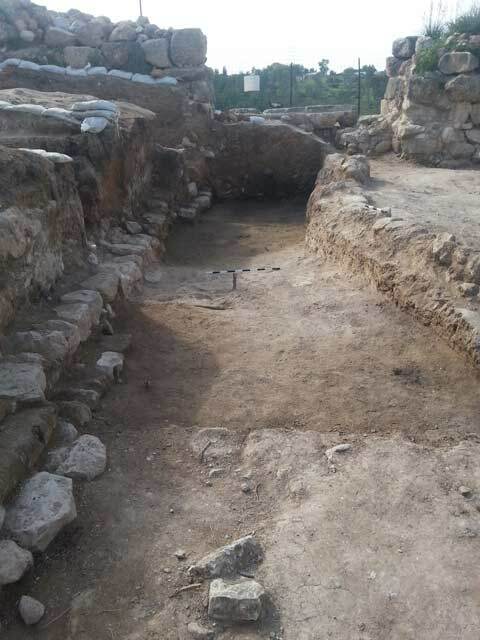 Volunteers, students from the Hebrew University of Jerusalem and staff members of the Israel Antiquities Authority Southern Regional Office also took part in the excavaiton. The gate area of Tel Lakhish was first excavated in the 1930s by the Wellcome Marston Archaeological Research Expedition headed by J.L. Starkey (Tufnell 1953:94–98). Starkey uncovered extensive areas throughout the mound, including the gate plaza and Stratum II in the inner gate. The Starkey expedition exposed the northern side of the two inner southern piers of the gate and one of the northern piers. From the early 1970s until the early 1990s, D. Ussishkin of Tel Aviv University conducted a large-scale excavation on ​​the tell, fully exposing the northern side of the six-chambered gate from Strata IV–III and part of the street that runs through the gate (Ussishkin 2004). The majority of the remains are from Stratum III (the eighth century BCE, up to the time of the Assyrian destruction in 701 BCE): the southern side of the six-chambered gate and the city street that runs through the gate, which were fully exposed (Fig. 2). Scant remains from Stratum II (seventh century BCE until the Babylonian destruction in 586 BCE) were discovered above the remains of the gate. A cooking installation was built on the wall (W103) that enclosed the Stratum III gate structure on the south. 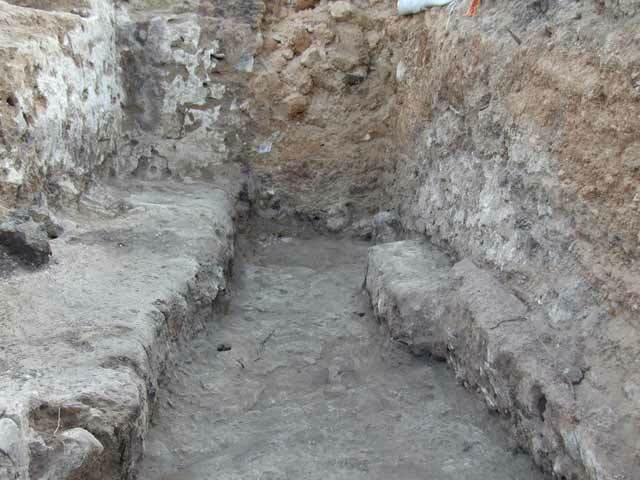 The foundation trench (L133; width 1.5 m) of the Stratum II city wall was exposed in the western chamber of the gate; the trench cut through the southern, mud-brick wall, which was coated with white plaster (Fig. 3). The gate (general dimensions 24.5 × 24.5 m) comprised six chambers and eight piers. The excavation in the southern part of the gate exposed three gate chambers, four piers and the street passing through the gate. The excavation results indicate that the western and eastern piers were c. 0.5 m longer than the two inner piers. Of the gate’s southern chambers, the southwestern was the most well-preserved, reaching a height of 4.26 m above the street level. The gate structure was constructed on a foundation of exceptionally large stones (max. dimensions 0.5 × 1.0 m), which supported courses of unfired mud-bricks (c. 0.15 × 0.50 × 0.50 m). All the southern gate chambers were coated with a layer of white plaster (thickness c. 3 cm). The southwestern chamber of the gate was delimited on the south and east by W103 and Pier 117, respectively. Its western part remained unexcavated because the Stratum II city wall was built above it. The remains of one of the piers (internal dimensions 2.8 × 5.8 m) were identified beside the entrance to the chamber, below the later wall. The chamber’s entrance (width 1 m) was set at the center of the chamber, between the two piers. Three steps, set in the entrance and built of stones lying on their broad side, led from the gate passage into the chamber. The entrance was delimited by two plastered mud-brick walls that narrowed the width between the two piers. Plastered benches were revealed on either side of the chamber (Fig. 4). Three benches were on the eastern side. The one closest to the opening, which was quite magnificent (0.55 × 1.40 m), had two armrests and seems to have been intended for two people. The two benches further along were flat (central bench 0.7 × 2.1 m; southern bench 0.7 × 2.3 m) and devoid of armrests. 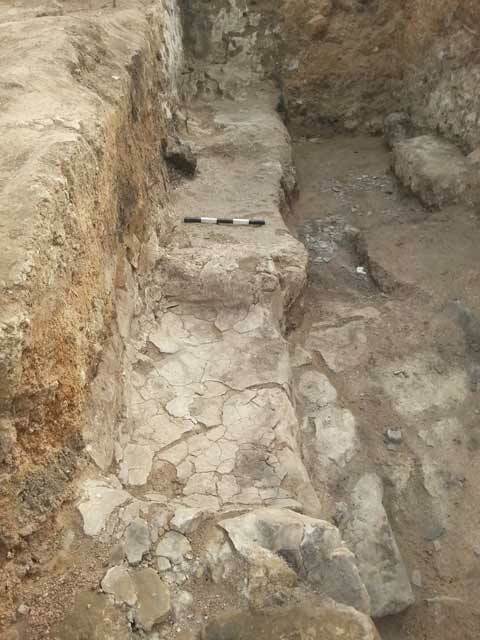 Remains of at least one bench that extended westward, beneath the Stratum II city wall and beyond the boundaries of the excavation, were found in the western part of the chamber. A thick destruction layer covered the floor of the chamber; it yielded jars, asymmetric bowls (scoops) and other pottery vessels, evidence of the Assyrian destruction of 701 BCE. Some of the jar handles were stamped with lmlk seal impressions (lemelekh hebrn), and one of the handles bore a personal seal impression—lenaham ʽavadi. The middle chamber (inner dimensions 2.80 × 5.25 m) was delimited on the south by W103, on the east by Pier 116 and on the west by Pier 117. Two stone-built steps led from the gate passage to the chamber. They were placed with their broad side facing the opening (width 0.9 m), which was delimited by two mud-brick walls that narrowed the width between the two piers. A fill consisting of fragments of plaster, mud-bricks and pottery sherds was found throughout the chamber, which was devoid of any special architectural finds. The eastern chamber (interior dimensions 2.80 × 5.65 m) was delineated on the south by W103, on the west by Pier 116 and on the east by Pier 111. Four well-dressed stone steps (Fig. 5) led from the gate passage to the chamber. The entrance to the chamber (width of opening c. 0.9 m) was narrowed by a plastered partition wall (W130) built of mud-bricks (width 0.55 m). The chamber was divided into a large northern room and a small southern room. The wall separating the rooms (W120; length 2.1 m, width 0.45 m) was constructed of plastered mud-bricks. The northern room had a plastered floor, part of which had settled. In this room, a narrow bench (length 1.2 m) was exposed alongside W120. The small southern room (1.25 × 2.80 m) was originally reached by way of an opening (width 0.9 m), which was evidently blocked and plastered when the room ceased to be used. A niche (depth 0.15 m) was installed in W103. The eastern part of the room was paved with flagstones, whereas its western part had a plaster floor, but it was severed by a pit (diam. c. 0.8 m). Inside the pit was a meticulously hewn square stone (0.39 × 0.50 × 0.56 m; Fig. 6) with a round hole (diam. 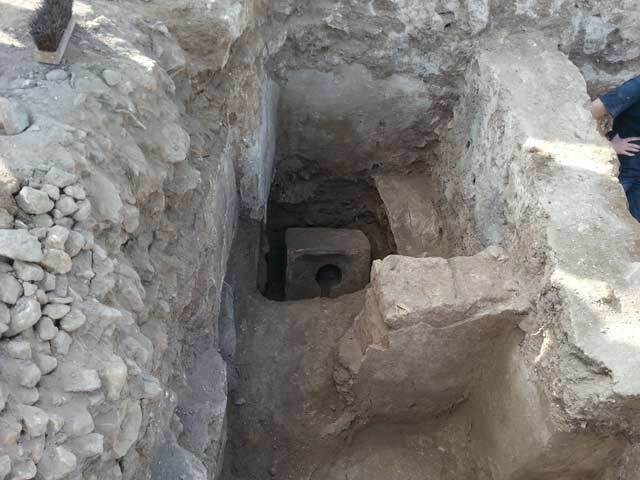 0.18 m) in its center, from which a channel (0.07 × 0.18 m) was hewn; this was probably a toilet, the likes of which are known from archaeological excavations in Israel and Transjordan (Shiloh 1984:18, Pl. 31:1; Eisenberg and De Groot 2006:131–132; Humbert and Zayadine 1992:253, Plts. A:XIV, B:XII; Biekowski 2002:166; De Groot and Bernick-Greenberg 2012a:99; De Groot and Bernick-Greenberg 2012b:352, Fig 10.3:2). Opposite the niche in W103, next to W120, were two adjacent horned altars built on a foundation of large, roughly hewn stones; The foundation and the altars were fully plastered as one unit (length 0.65 m, width 0.37 m, height 0.9 m; Fig. 7). Seven of the altar horns had been truncated with a sharp tool. Numerous pottery vessels were found in the room, including a large quantity of lamps, bowls and stands. Gate passage. The passage is widest in its central part (6.2 m) and narrows toward the exit of the gate structure (5.2 m), where is turns into a city street. The passage had a tamped-earth floor. On the southern side of the gate were stone benches built of stones placed on their broad side (Fig. 8). At the entrance to the eastern chamber was a plastered bench, unlike the stone benches. The 701 BCE destruction layer, discovered throughout the excavated part of the passage, contained fired mud-bricks, arrowheads and broken pottery vessels, including asymmetric bowls (scoops). 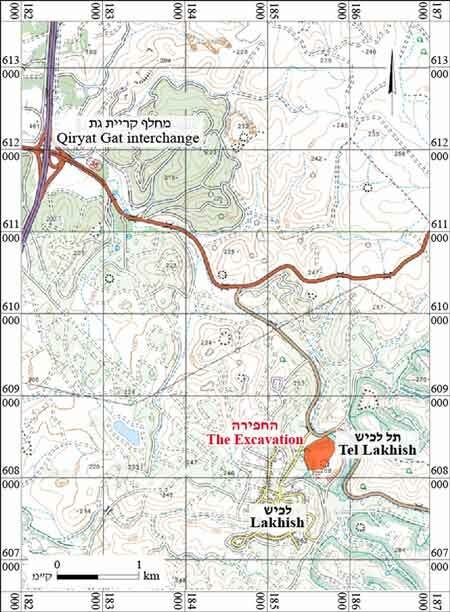 Lakhish (Lachish) was the second-most important city in the Kingdom of Judea after Jerusalem. 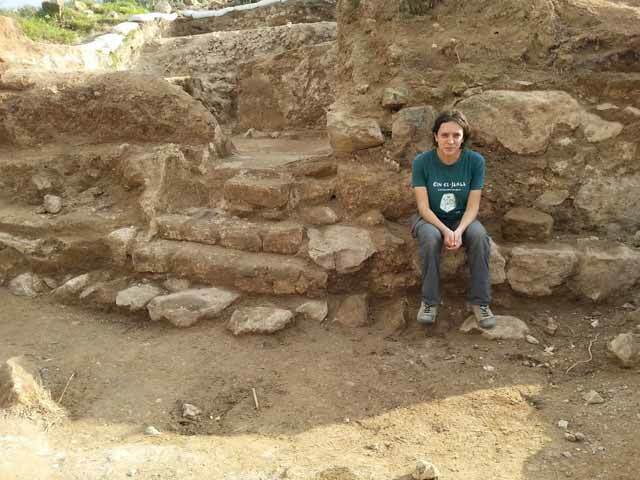 The city’s six-chambered gate is the largest gate structure discovered in Israel to date, and it accurately reflects the status of the city in the eighth century BCE. The remains of the gate, which were preserved to a great height, show the manner in which gates were constructed in the Iron Age, utilizing stone foundations and mud-bricks. The white-plastered walls and openings to the chambers were preserved inside the gate. Two of the chambers contain evidence of administrative and cultic uses. The plastered benches along with the lmlk jars and asymmetric bowls (scoops) in the western chamber attest to the economic and administrative activity that took place there. A gate shrine, comprising a staircase ascending to a hall (hekhal), was discovered in the eastern chamber. A doorway on the southeastern side of the hall led to another room that served as an inner sanctum (devir), with two altars with truncated horns standing opposite a niche. The shrine had been desecrated and converted into a latrine, and the entrance to the inner sanctum was sealed. This is the first evidence in Israel of the destruction of a shrine in this manner. The entire gate structure and its southern chambers were demolished in a violent destruction attributed to Sennacherib, King of Assyria. Evidence of this destruction was found throughout all of the excavation areas in the gate structure. Bienkowski P. 2002. Busayra Excavations by Crystal M. Bennett 1971–1980. Oxford. De Groot A. and Bernick-Greenberg H. 2012a. Excavations at the City of David 1978–1985 Directed by Yigal Shiloh VIIa: Area E, Stratigraphy and Architecture: Text (Qedem 53). Jerusalem. De Groot A. and Bernick-Greenberg H. 2012b. Excavations at the City of David 1978-1985 Directed by Yigal Shiloh VIIb: Area E, The Finds (Qedem 54). Jerusalem. Eisenberg E. and De Groot A. 2066. An Iron Age Tower near Ramat Rahel. In E. Baruch, Z. Greenhut and A. Faust eds. New Studies on Jerusalem 11. Ramat Gan. Pp. 129–133 (Hebrew). Humbert J.-B. and Zayadine F. 1992. Trois campagnes de fouilles à Ammân (1988–1991) Troisième terrasse de la citadelle (mission franco-jordanienne) RB 99:214–260. Shiloh Y. 1984. 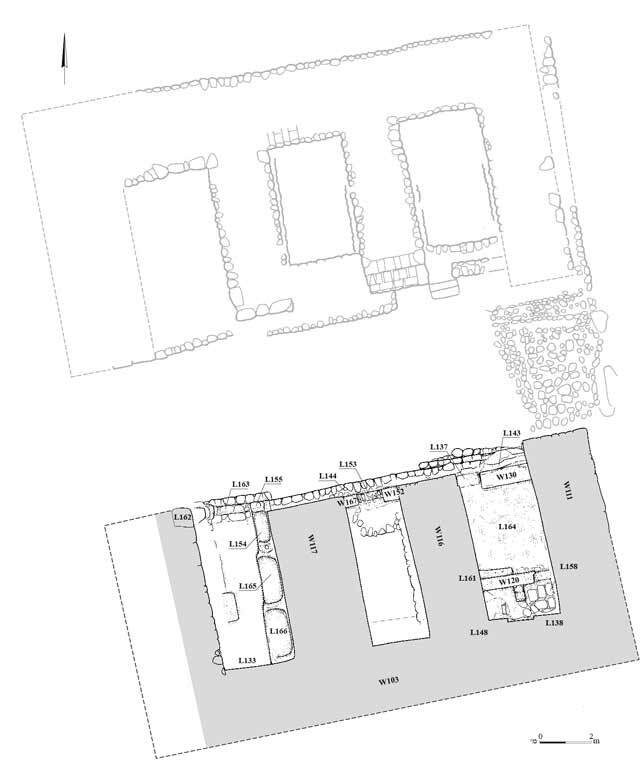 Excavations at the City of David I: 1978–1982, Interim Report of the First Five Seasons (Qedem 19). Jerusalem. Tufnell O. 1953. Lachish III: The Iron Age. London–New York–Toronto. Ussishkin D. 2004. Area GE: The Inner City-Gate. In D. Ussishkin ed. The Renewed Archaeological Excavations at Lachish (1973–1994) (Tel Aviv University Institute of Archaeology Monograph Series 22). Tel Aviv. Pp. 624–689. 2. The six-chambered gate at Tel Lakhish, plan (the southern side is colored gray). 3. The foundation trench from Stratum II, looking south. 4. Plastered benches in the western chamber, looking south. 5. The entrance to the eastern chamber, looking south. 6. The southern room in the eastern chamber, looking west. 7. The entrance to the southern room in the eastern chamber and the stone altars, looking west. 8. The gate passage and benches, looking west.